Front row, left to right: Veronica Rivero, Brittany Weaver (Chair), Rosa De Los Santos, Erin Martin (Co-Chair), Cori Suman. We did it! We completed our capacity interview! 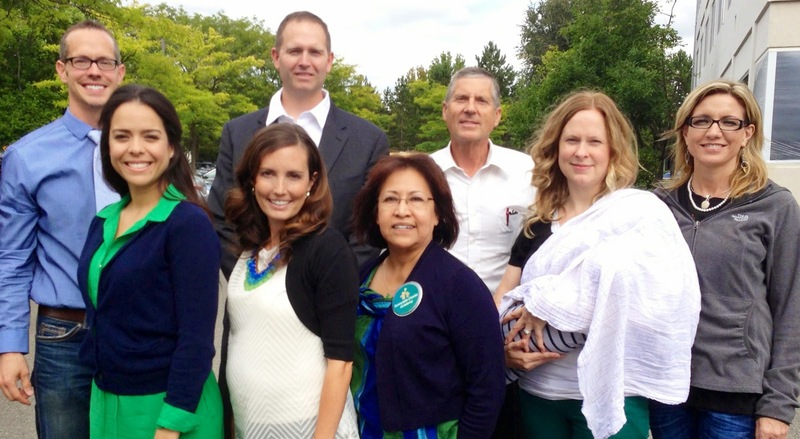 A big thanks to the members of our amazing board for driving all the way to Renton, WA in one day for this interview. The questions were tough, but nothing our team couldn't handle. We are so honored to be a part of such a great team and a great cause! What is a capacity interview? The capacity interview is considered by the Washington State Charter School Commission to be a key component of the application evaluation process. We have already worked very hard to put our plan for a charter school on paper (a 500 page application). During the capacity interview, we had the opportunity, in person, to elaborate on our vision for the school; respond to questions and concerns from the evaluation team; and demonstrate that our team has the capacity and experience to successfully implement the program set forth on paper. Our responses and conduct in the interview will be considered by the evaluation team in preparing their recommendation to approve or deny our school. The commission will then review the recommendation from the evaluation team on October 9th and vote to approve or deny our school. If we are approved by the commission on October 9, 2014, we will officially become a public charter school and will move forward with the start-up process of implementing the program and recruitung students for the 2015-16 school year. 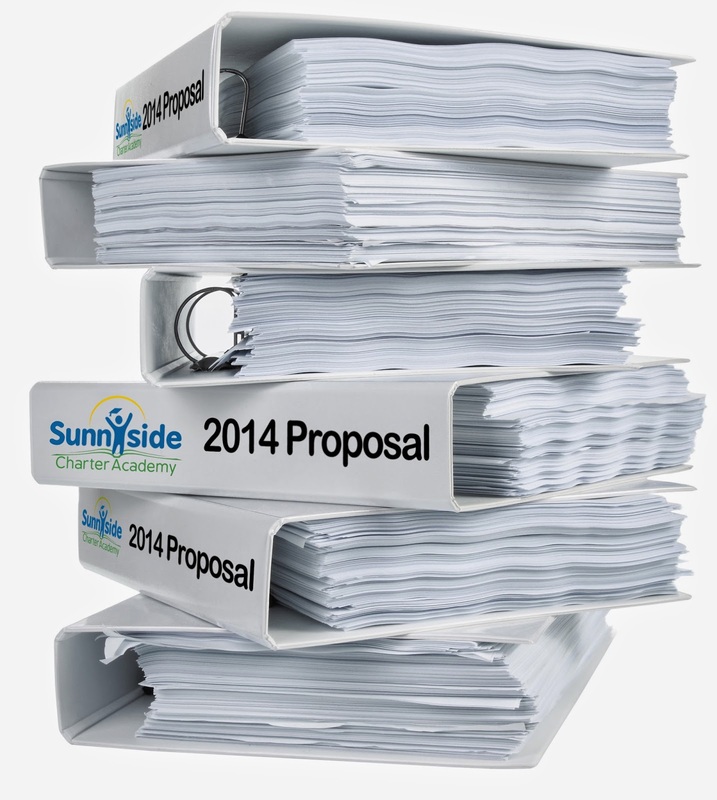 This past Tuesday (July 15, 2014), we officially submitted our proposal of Sunnyside Charter Academy--a fully inclusive, parent involved, blended learning school--scheduled to open in the fall of 2015! Charter schools are free, independent, public schools governed by nonprofit boards. This is our second application to the Washington State Charter School Commission. We submitted our first application in November 2013 and came very close to being approved. This round, we knew exactly what needed to be fine-tuned, and worked very hard at creating what we believe is going to be an exceptional, high-quality school. For this round, only 7 schools turned in applications compared to the 23 applicants from last November. 4 of the applicants, including our school, submitted proposals to the commission, while the other 3 have been submitted to the Spokane School District, which is authorized to approve its own charters. 4) A school in Pierce County that is also focused on inclusion called "Village Academy"
From the first round in November, we learned that the charter application process in the state of Washington was very rigorous. It was a process that left us exhausted and not quite sure we would be up for the task again so soon. Many organizations submitted letters of intent to apply during this round and last round, but a little under half of the applicants submitted actual proposals because it was so laborious. Washington state's charter school law is considered one of the strongest charter laws in the nation. The state and those authorizing charter schools aren't messing around. They are serious about only approving high-quality schools that, as the commission's strategic vision states, "significantly improve student outcomes, particularly for at-risk students". We are serious too! We wouldn't be applying again and putting ourselves through this process so soon after not getting approved, if we weren't passionate about it and didn't believe in this cause. Sunnyside Charter Academy was founded by Brittany and myself--just two moms who want to bring another educational option to kids here in Sunnyside. Since last summer we've grown and become a nonprofit organization with a governing board of 7 highly skilled individuals determined to make this school happen. So what are the next steps now that we have submitted our application? Take a peek at the graph below and see what's in store for Sunnyside Charter Academy and the board of directors as we move forward in this next round of the application process. As of now, our application has just been deemed "complete", so we are moving on to the next step which involves sending 10 copies of our 450+ page application to the commission. Our application will be meticulously reviewed by select members of the commission, as well as an evaluation team of 4 to 6 members from across the country. We will then travel to Renton, WA and be interviewed in August by this evaluation team. Our board will be asked a lot of hard questions at the 1 1/2 hour interview about our educational model, financial capacity, and governing board abilities. In September we will speak at a public forum attended by at least 3 members of the commission where people from Sunnyside (and the Lower Valley) can come and speak on our behalf and support us in our effort. By the beginning of October, the commission will vote and decide if our school should be approved based on the results of our application, interview, and public forum presentation. During the next couple of months, the members of our Development Committee will be actively involved in community outreach efforts. We will be posting more blog and facebook posts explaining in detail what our school is about. We will also be asking members of the community to send letters of support to the commission and/or speak on our behalf at the public forum. We will also be sending out postcards and posting flyers requesting supporters to attend our public forum (date and time TBD). We hope to show the commission that parents and community members here in Sunnyside want their voices heard, and want to be partners in their children's education. We are confident that our proposed school will impact Sunnyside and the surrounding community in a positive way. We look forward to bringing a high-quality public charter school to this area. We are grateful for all the support and help we've received so far from parents, educators, and community organizations. We will continue to forge ahead in this arduous process. Wish us luck! 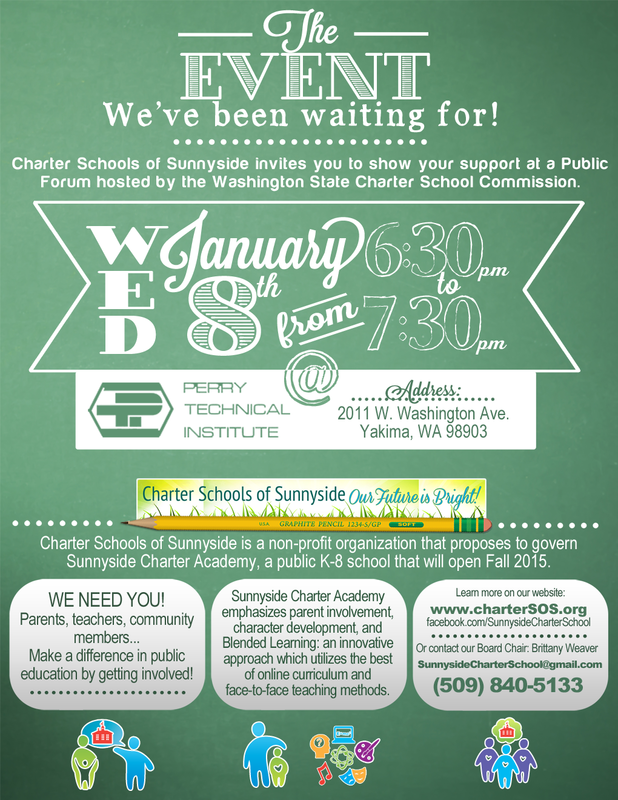 To get involved and help support Sunnyside Charter Academy, email us at sunnysidecharterschool@gmail.com. One of our board members, Erin Martin, had the opportunity to attend an inclusion conference in April. One of the many presenters there was an organization called SWIFT (Schoolwide Ingegrated Framework for Transformation). The SWIFT presentation was very inspiring. This is an organization that values all the same things our charter school is trying to implement! It was exciting to see a framework already set in place and implemented in more than 64 schools across the country. They even had amazing research and best practices to support their model. Unfortunately at this time, they are under a government grant that only allows them to go into specific States and a select few schools...our State, is NOT currently one of those lucky enough to utilize their expertise first-hand. So gaining access to their technical support will probably take some time. But that doesn't mean we can't learn about them, read the research, and apply what we learn to our school's own framework. Attached to this post is a video of what one of these schools looks like and the key aspects of an inclusive school. It is well worth the 15 minutes of watching. And thank you to the SWIFT organization for providing a video such as this to learn from. 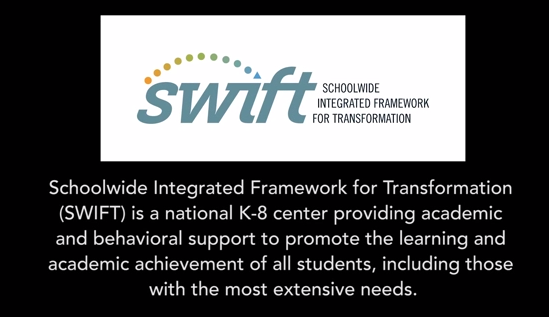 You can learn more about SWIFT by going to their website at: swiftschools.org Enjoy!!! Below is a letter sent out from the commission. See the highlighted paragraph below with written remarks about our school. It's extremely important to note that we were the only school denied that was mentioned in this letter and urged to reapply for this next round. The Washington State Charter School Commission culminated its first round of charter school authorization on January 30th, 2014. Public participation in this process has been extensive, and the commission is excited at the prospect of further community involvement with the next round of authorization. The first authorization process in Washington State began with 28 notices of intent received on October 22, 2013. Of those notices, 18 non-profit organizations submitted 19 proposals by the November 22, 2013 deadline. During the first three weeks of January, 2014 the commission traveled from Spokane, to Yakima, Hoquiam, Seattle, Renton, and Tacoma, holding a total of 9 public forums. The forums represented a chance for applicants to present their proposals to the community that they intend to serve, and for the community to discuss the applicants. The community turnout was substantial with a combined attendance estimated at over 800. In the weeks leading up to the January 30th authorizations, the commission office received over 150 written comments about the proposed charters. The commentary showed an engaged dialogue around the applicants, a clear interest in the authorization process, as well as growing public interest charter school law. Excel Public Charter School, Kent: Excel was formed by a Washington State team led by Adel Sefrioui (Executive Director, STEP Ahead) and will grow to serve grades 6-12. Excel Public Charter School will provide all students an academically rigorous, science, technology, engineering, and math (STEM) focused, college preparatory program that will help them achieve both academic and personal success in college and career. Additionally, there will be opportunities for high school students to complete STEM internships with local companies. First Place Scholars Charter School, Seattle: First Place currently operates a private school serving students facing trauma. They will be utilizing their experience to re-launch as a public charter school educating and stabilizing students living in poverty and with multiple traumas, including homelessness. The school’s mission will focus on helping students to rise above their personal circumstances, accelerate academically and prepare for college and career. Rainier Prep, South Seattle: Rainer Prep was formed by a Washington-based team led by veteran educator Maggie O’Sullivan, who was a teacher for six years and has served as a principal in Federal Way since 2004. Rainier Prep's mission is to enroll every graduating eighth grade student into a college prep high school program, to prepare every scholar to excel at a four-year college, and, ultimately, to ensure that every scholar is ready to serve as a leader in their community. SOAR Academy, Tacoma: SOAR Academy was formed by a Washington-based team led by veteran educator Kristina Bellamy-McClain, has worked in public education for 13 years, most recently as a principal in Seattle. SOAR will offer a small, intimate, classroom-based, personalized environment. SOAR’s mission is to provide students with a rigorous, engaging, and personalized educational experience, preparing them to become productive members of a diverse, global society and equipping them academically and socially for success in and through high school, college, and beyond. Summit Public Schools – Olympus (Tacoma) and Sierra (South Seattle): Summit Public Schools currently serves approximately 1,600 students from diverse communities in six schools located in the San Francisco Bay Area. Ninety-six percent of Summit students are accepted to at least one four-year college or university, with graduates on track to complete college at double the national average. The Commission has noted Summit’s educational model in its recommendations, including its rigorous courses, creative teaching models, high-levels of school involvement and participation and a defined path to success for students. Washington State Charter Middle School #1 (Green Dot Public Schools), Tacoma: Green Dot Public Schools was founded in 1999 in direct response to the poor state of public high schools in the Los Angeles area. Green Dot schools are purposefully located in some of California’s most underserved neighborhoods and its student population is largely minority and low-income. Today, Green Dot currently serves more than 10,000 students in the Los Angeles area with plans to expand to Memphis, Tenn. The Commission noted in recommendations that Green Dot has strong curriculum and instructional design, with an emphasis on college preparatory work. The commission is confident that these schools will deliver an outstanding, innovative, and impactful education. As well, the commission applauded the efforts of those applicants not approved in this round. Of high mention was Sunnyside Charter Academy whose mission was to provide a challenging, enriching, and meaningful education that nurtures and respects the individual student and the diverse community of learners in an inspiring environment. The application proposed a K-8 school to open in Sunnyside, WA in 2015. Sunnyside Charter Academy showed a highly developed educational program design and organizational plan. The commission encouraged Sunnyside Charter Academy to address certain financial questions, and reapply to the next round of authorizations. The Commission looks forward to the next round of authorizations, scheduled to begin with the release of a request for proposals on April 15, 2014. Notices of intent are due June 15, 2014, with proposals due July 15, 2014. The commission is applying the experience gained throughout this process, with an eye towards increased public interaction and outreach. With the range of applicants in this first round, the commission eagerly awaits the upcoming proposals, and their plans to educate at-risk students in Washington State." We have some good news and some bad news…. 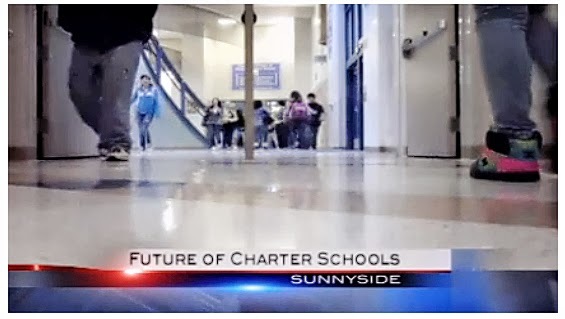 The bad news first: If you’ve been keeping up with the media reports, you may already know that the Washington State Charter School Commission did not approve Sunnyside Charter Academy last week. Our application was evaluated by a team of four individuals that also interviewed our Board of Directors. That evaluator team submitted a report to the Commission, who reviewed the reports for all 19 applicants, and then voted last Thursday to officially approve or deny each application (approving only 7). The evaluation report for Sunnyside Charter Academy states that we “Meet the Standards” for both our Education Plan and our Organizational Plan. We only “Partially Meet the Standards” for our Financial Plan; it was for this reason that our application was denied. The GREAT NEWS is that we now have five months to improve our Financial Plan. Considering that we were able to create an Education Plan and Organizational Plan that met the standards in less than three months is an amazing feat, and we are THRILLED with what we have accomplished so far. We gained valuable experience by going through the interview and evaluation process, and are confident that we know what we need to do to be approved in the next cycle. Our future looks bright and we are optimistically looking forward to the next application deadline, which is July 15, 2014. Upon approval at that time, we will still be able to open in fall 2015! We continue to welcome your input; that’s what creating a grass-roots community school is all about! Thank you for your continued interest and support! 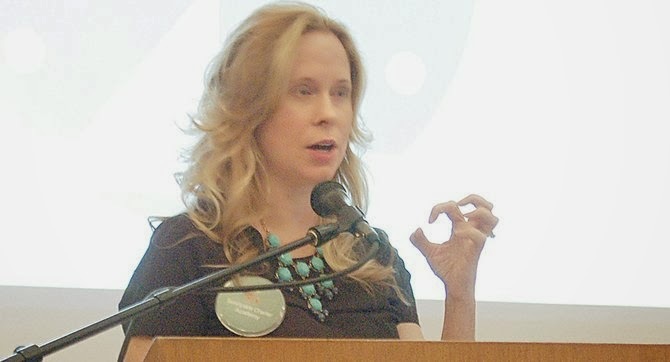 Erin Martin speaks about the proposed Sunnyside Charter Academy at a public forum held last night as part of the state’s process in approving charter schools. Photo by Laura Gjovaag. 1) 300+ page application (providing extensive details on educational programs, school performance standards, governance and management, budget projections/plans, and facility options.) You can download and read the actual application here . We think it's a pretty amazing document that over 20 parents, teachers, community members, and other professionals helped write. 3) One hour Public Forum at Perry Technical Institute in Yakima, held January 8th at 6:30 pm. This forum was open to both supporters and non-supporters alike. Three members of the Washington State Charter School Commission were present. They listened to a 10 minute presentation given by Brittany Weaver and Erin Martin, founders of Charter Schools of Sunnyside; the non-profit organization proposing to govern Sunnyside Charter Academy once the charter has been granted. Followed by the presentation was a 30 minute public comment forum. Fortunately for us, all the public comments were in support of our vision. A variety of people spoke on several issues they felt strongly about which included: Inclusion and Special education, Parent involvement, Highly capable programs, and Community Partnerships. Even a couple of young school aged kids spoke. One spoke on how being raised in a monolingual family and the importance of community and parent involvement positively affected her life. You can read the full article summarizing most of the speakers by clicking this link . 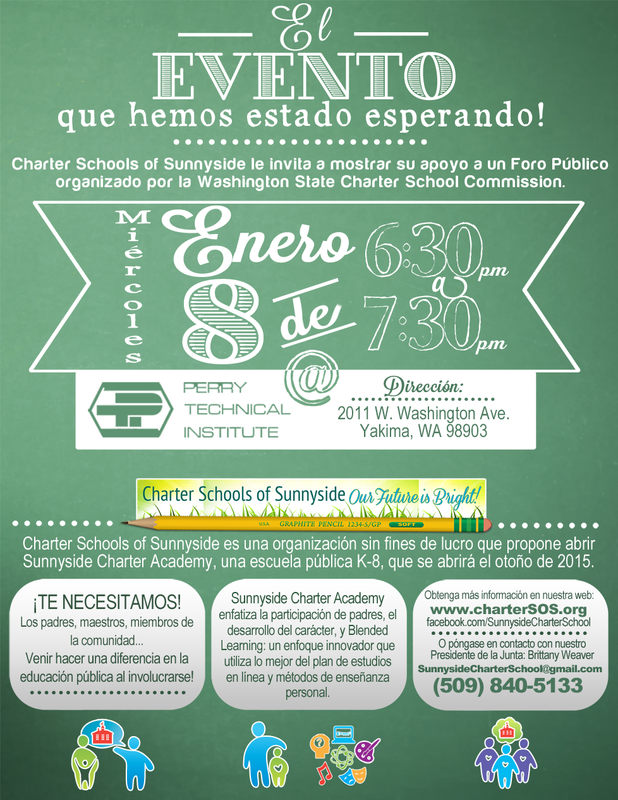 Over 40 people attended the forum in support of Sunnyside Charter Academy. Words cannot express our gratitude for this overwhelming support traveling the 45 minutes to Yakima on such a cold, wintery night and on such short notice too. It goes to show that there are many people in our community who really are passionate about our kids having another educational option here in Sunnyside. We are deeply grateful for the support. Ring in the New Year!!!! Happy New Year friends! We hope you have enjoyed the holiday season. We are excited to ring in the new year with the announcement of an event coming up next week! Many of you are aware that we completed and submitted our application last month. 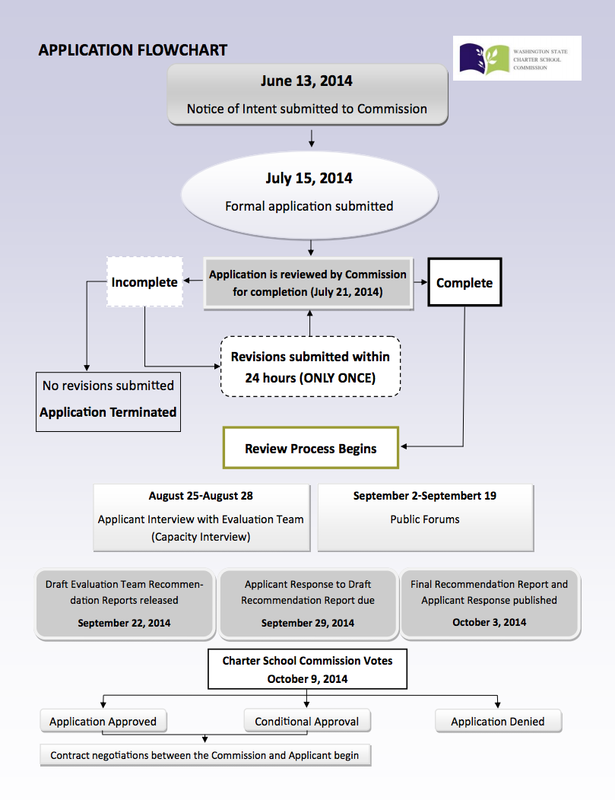 The WSCSC (Washington State Charter School Commission) has reviewed it and deemed it complete! Which takes us to the next step on our journey to opening Sunnyside Charter Academy: a board member interview with the WSCSC and a Public Forum. If you've ever wanted to be involved in helping to make this happen, NOW IS THE TIME! We need your support! PLEASE COME and join us!